Download "1. What are some advantages of using fossil fuels?" 1 Nonrenewable Energy Resource Description Environmental Impacts Coal Black or brown solid combustible substance. oil A viscous liquid derived from petroleum, esp. for use as a fuel or lubricant. Natural gas Flammable gas, consisting largely of methane and other hydrocarbons, occurring naturally underground and used as fuel. Nuclear Changes can occur in the structure of the nuclei of atoms. These changes are called nuclear reactions. Energy created in a nuclear reaction is called nuclear energy, or atomic energy. 1. 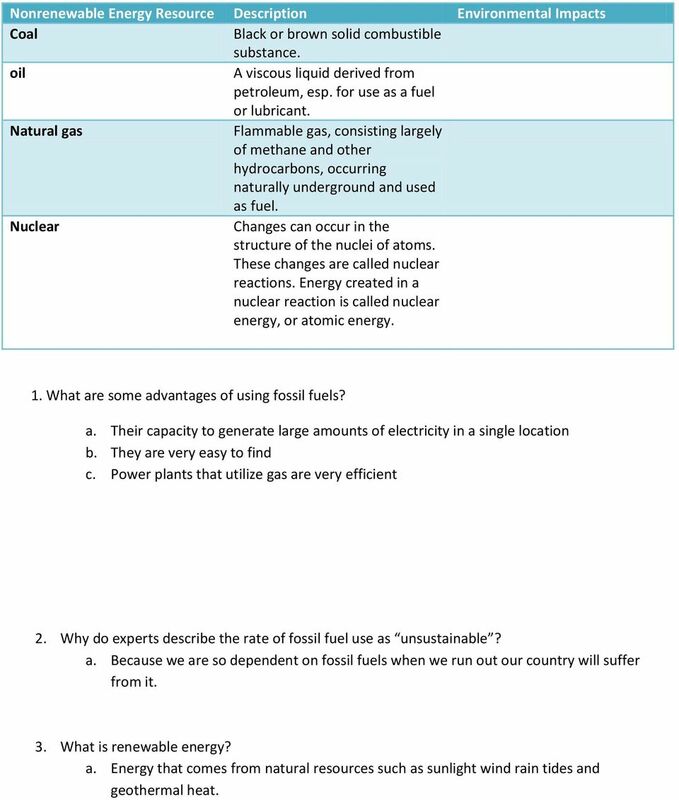 What are some advantages of using fossil fuels? a. Their capacity to generate large amounts of electricity in a single location b. 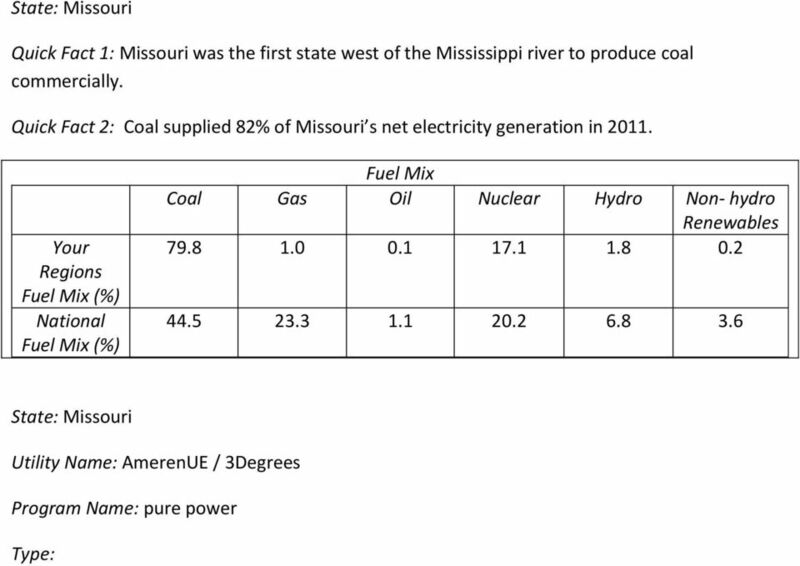 They are very easy to find c. Power plants that utilize gas are very efficient 2. Why do experts describe the rate of fossil fuel use as unsustainable? a. Because we are so dependent on fossil fuels when we run out our country will suffer from it. 3. 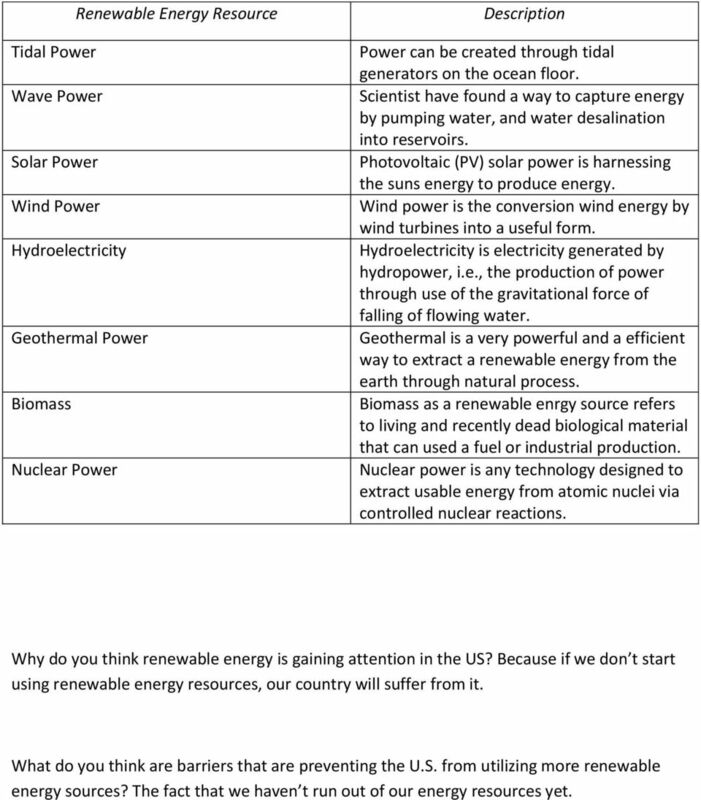 What is renewable energy? a. Energy that comes from natural resources such as sunlight wind rain tides and geothermal heat. 2 Renewable Energy Resource Tidal Power Wave Power Solar Power Wind Power Hydroelectricity Geothermal Power Biomass Nuclear Power Description Power can be created through tidal generators on the ocean floor. Scientist have found a way to capture energy by pumping water, and water desalination into reservoirs. Photovoltaic (PV) solar power is harnessing the suns energy to produce energy. Wind power is the conversion wind energy by wind turbines into a useful form. Hydroelectricity is electricity generated by hydropower, i.e., the production of power through use of the gravitational force of falling of flowing water. Geothermal is a very powerful and a efficient way to extract a renewable energy from the earth through natural process. Biomass as a renewable enrgy source refers to living and recently dead biological material that can used a fuel or industrial production. Nuclear power is any technology designed to extract usable energy from atomic nuclei via controlled nuclear reactions. Why do you think renewable energy is gaining attention in the US? Because if we don t start using renewable energy resources, our country will suffer from it. 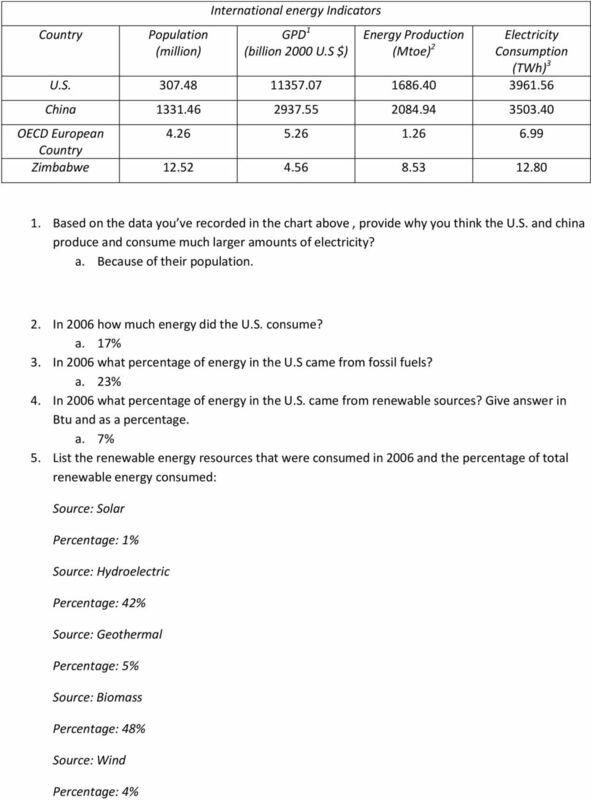 What do you think are barriers that are preventing the U.S. from utilizing more renewable energy sources? The fact that we haven t run out of our energy resources yet. Pre-Release Material for examination on 16 June 2016. To be opened on receipt. A new copy of this Folder will be given out in the examination. GCE A level 124/1-B GEOGRAPHY G4 Sustainability S16-124-1B Pre-Release Material for examination on 16 June 216. To be opened on receipt. A new copy of this Folder will be given out in the examination.